I have just completed a new state of one of my most popular designs, Natsu (Summer) , under a new title and with a new colour scheme, and it now stands alone and does not belong to any other set. 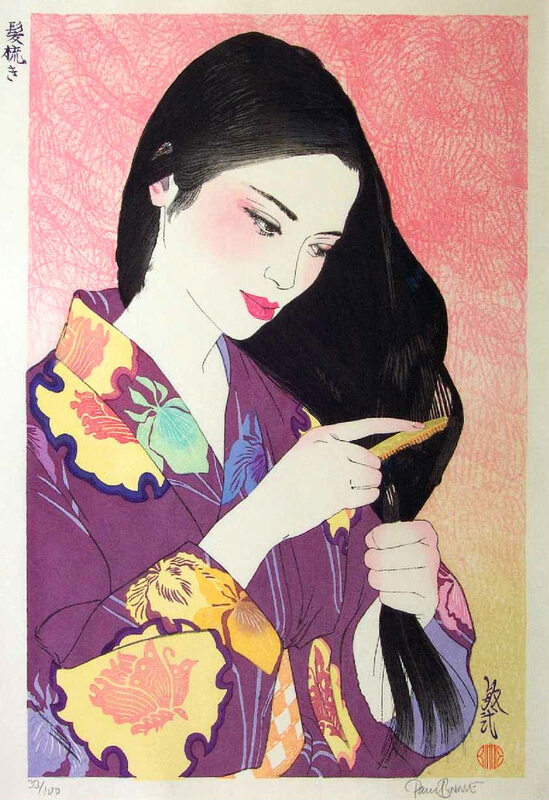 Kamisuki (Hair Combing) has a mauve-purple kimono with a variety of other colours for the patterns of irises, butterflies etc, including bokashi, or shading in the flowers. There is also 22-carat gold leaf on the comb, lacquer printing in the hair, and extensive embossing to suggest the fabric of the kimono, and the pink baren sujizuri background shades into yellow below, reflecting the tones of the kimono motifs. While the first state of this design was a private commission of only 50 impressions, and therefore has been sold out from me for a very long time, the new state is released this month in an edition of 100. It is an oversized Large Dai-Oban sheet of 48 x 34 cm, or 19 x 13.5 inches and employs 34 printings, including embossing and gold leaf. An oil painting of the same subject will be included in my September solo exhibition at Scholten Japanese Art in New York, a show which will examine the link between drawings, paintings and prints in my work.